Canine Emperor River Demmy-Stover handles Eddy as he jumps off a block during a rally event. 4 Pawz and Clawz 4-H Club Advisor Kristina Morgan (in green) watches as Hannah Hall and Cookie compete during the show. Riley Mitchell-Wolfe and Griffey dance together during a freestyle routine. 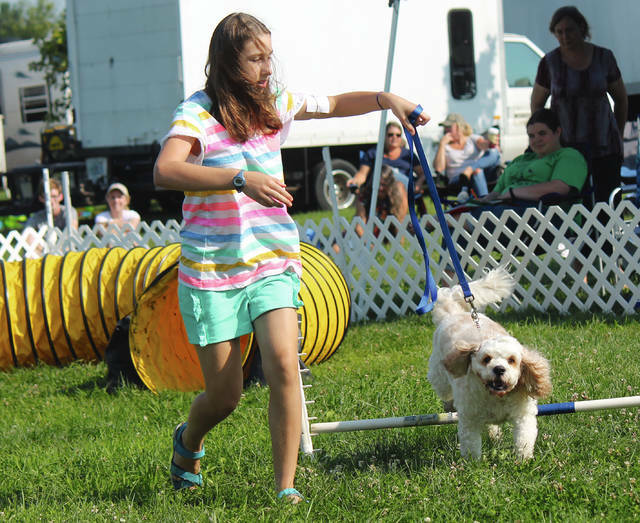 Anna Bolton | Greene County News Gracie Heiter and Toby run the agility course together during the Dog Show Aug. 3 at the Greene County Fairgrounds. Shay Lee jumps through a hoop with handler Keely Sims by her side. 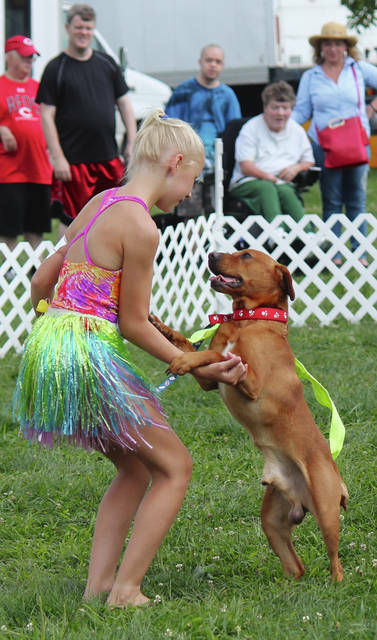 XENIA — Two dogs and their handlers competed in the first dog show at the Greene County Fair five years ago. 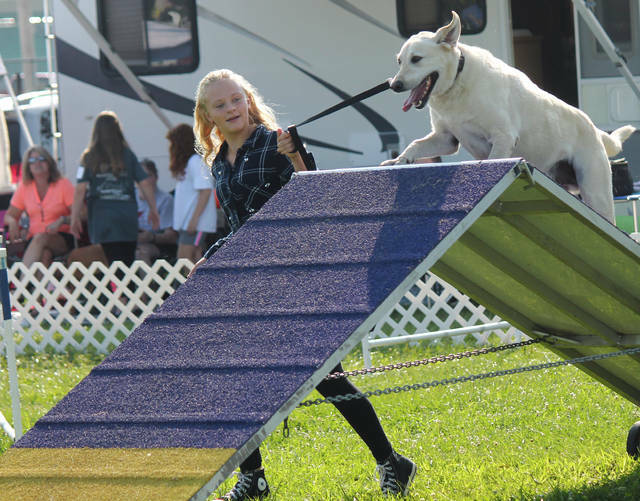 This year, on Aug. 3, 15 4-Hers brought their dogs to the fair for a show that has grown to include an agility course, a rally event, freestyle dance, showmanship, obedience and a fun show. And their parents credit 4 Pawz and Clawz 4-H Club Advisor Kristina Morgan for this. Morgan showed dogs in 4-H for 10 years before beginning judging, and then founding 4 Pawz. She also advises a dog 4-H club in Fayette County, where she lives. Morgan, who calls herself a life-long 4-Her, said the kids remind her of herself. The advisor said the club starts meeting in January to work on their projects and prepare for the fair. A historic first for the club, two competed at the state fair this year. Riley Mitchell-Wolfe with her dog Griffey and River Demmy-Stover with his dog Eddy both earned titles there. The two ended the first half of the show dancing together in a freestyle routine. The 12-year-old also danced at both fairs to “How Far I’ll Go” in a hula-style skirt. https://www.fairborndailyherald.com/wp-content/uploads/sites/50/2018/08/web1_Emperor.jpgCanine Emperor River Demmy-Stover handles Eddy as he jumps off a block during a rally event. 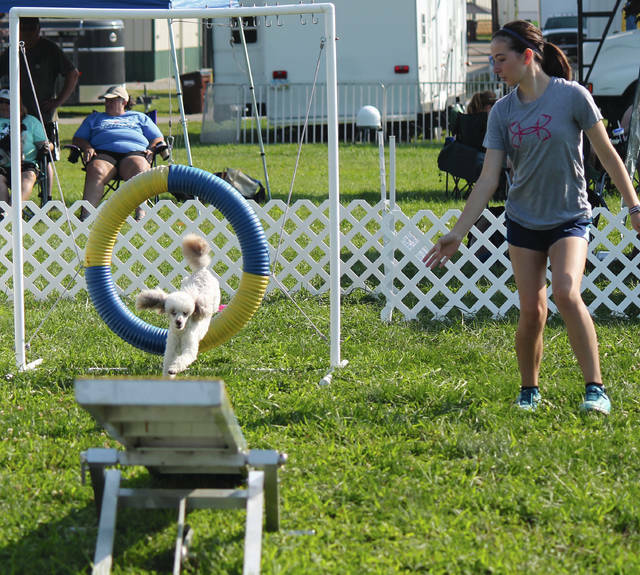 https://www.fairborndailyherald.com/wp-content/uploads/sites/50/2018/08/web1_Hannah.jpg4 Pawz and Clawz 4-H Club Advisor Kristina Morgan (in green) watches as Hannah Hall and Cookie compete during the show. https://www.fairborndailyherald.com/wp-content/uploads/sites/50/2018/08/web1_Hula1.jpgRiley Mitchell-Wolfe and Griffey dance together during a freestyle routine. 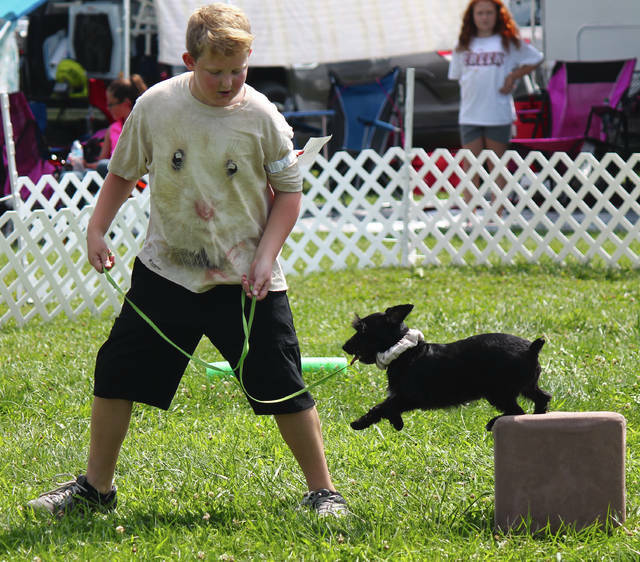 https://www.fairborndailyherald.com/wp-content/uploads/sites/50/2018/08/web1_Lab.jpgAnna Bolton | Greene County News Gracie Heiter and Toby run the agility course together during the Dog Show Aug. 3 at the Greene County Fairgrounds. https://www.fairborndailyherald.com/wp-content/uploads/sites/50/2018/08/web1_Ring.jpgShay Lee jumps through a hoop with handler Keely Sims by her side.